At a talk he gave to the Federation of Recorded Music Societies weekend at Daventry a couple of months ago Simon Perry, the boss of Hyperion Records, revealed that the company had given serious consideration to the idea of issuing this disc as part of their long-running and popular series of “Romantic Piano Concertos”. This would have had the additional advantage of ensuring sales to the many purchasers who have been avidly following the series. These releases have been invaluable in bringing to the attention of listeners many works largely or totally neglected which have ill-deserved this fate. Furthermore, while some of the issues of pieces written in pale imitation of Chopin, Schumann, Brahms, Rachmaninov and their ilk have unfortunately revealed all too clearly the reasons for their exclusion from the repertory, these duds have been few and far between. This may have surprised those unwilling to venture off the beaten track, if not the more experimental listeners. These works by Dimitar Nenov, on the other hand, have a big-boned structure and muscular strength that put them far above the less impressive competition. It is pleasing to be able to report that following Perry’s playing of an extract from the Ballade included on this disc, I understand that some advance sales at Daventry resulted. Nenov was a polymath, born in Bulgaria. During his fairly brief life he had an extensive career as a concert pianist, performing throughout Eastern Europe, although he does not seem to have made stage appearances anywhere westwards of Germany and Italy. However, he fell into disfavour following the establishment of Soviet regimes in the eastern bloc following the Second World War –his family traced descent from a general in the Tsarist army. Although he had been partially rehabilitated by the time of his death, many of his recordings made during his lifetime were wiped by radio authorities in Hungary and Bulgaria – none are currently available, it seems. It is sad to discover that Khachaturian joined in this chorus of condemnation. Following Nenov’s death, his reputation even in his native Bulgaria dwindled to absolute obscurity. All the music on this disc existed only in manuscript, and the preparation of printed materials is entirely due to the pianist on this recording, Ivo Varbanov, who has taken up the cudgels on his compatriot’s behalf – for which many thanks are due. It is difficult to compare Nenov’s music with that of his Bulgarian contemporaries, most of whom – with the possible exception of Pancho Vladigerov – are equally unfamiliar in the west. To describe his style, which is clearly Bulgarian in origin, one should perhaps cite a combination of Bartók, Busoni, Szymanowski and Enescu – but that is merely to indicate a general geographical area in which the composer operates. The useful booklet notes by Martin Georgiev – complete with translations into German and French – note that among Nenov’s multifarious extra-musical accomplishments was a career in architecture. The Piano Concerto, a massive sonata form incorporating elements of slow movement variations and a scherzo finale, is correctly described by the writer as a “cathedral-like edifice”. Even the more apparently rhapsodic construction of the Ballade is highly organised around the basis of a single theme. The opening of the concerto, after a primal scream from the orchestra, described in the booklet as “ecstatic”, has all the massive force of Busoni – as a pianist Nenov had studied with Busoni’s pupil Egon Petri. It quickly subsides into a more lyrical frame of mind, where piano arpeggios surrounded by a halo of solo strings then build slowly to an orgiastic climax which brings the first section to a close. The ‘slow movement’ which follows without a break provides a more withdrawn set of variations on a Bulgarian folksong, including a ‘Brahmsian’ chorale which returns triumphantly in the more whimsical finale. This in turn concludes with a Brucknerian superimposition of themes from various sections from the concerto in a ‘dream-like’ coda. The Ballade is a more restrained work, with some beautiful pastoral moments which have a withdrawn sense of contemplation. One of these half-way through has a sense of rapture which conjures up the atmosphere of Vaughan Williams’s Fifth Symphony – yes, it really is that good. It then develops into a rousing epic climax. It is certainly fair to say that this issue establishes Nenov as a major voice of his country and period, totally deserving of resurrection, and this performance and recording do the music full justice. The concerto may be initially somewhat forbidding in tone, but the Ballade is immediately approachable and should appeal to all listeners whose taste for piano concertos does not stop short at Prokofiev. 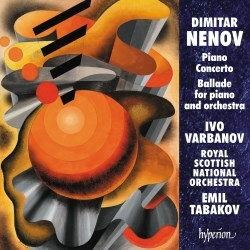 One looks forward with anticipation to further releases of Nenov’s music.